The Hampton Inn - Suites Stillwater hotel in Oklahoma is decorated in a traditional design. Our hotel provides modern day comforts with Old World charm. For two consecutive years we were awarded the Connie Award one of Hilton*s highest recognitions. The Hampton Inn - Suites Stillwater hotel offers a heated outdoor pool in a beautiful courtyard setting that includes a soothing water feature spa and a covered seating area with an outdoor fireplace. In Oklahoma our meeting space is available in a traditional meeting room as well as an executive boardroom. 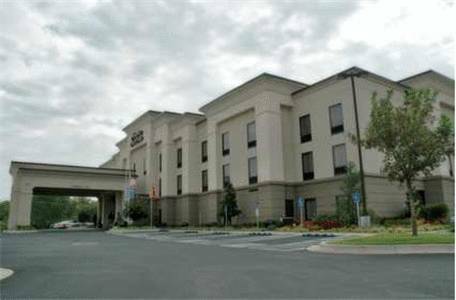 This Hampton Inn - Suites offers an exercise room and complimentary access to the full service health club adjacent to our hotel. All rooms include high-speed internet access refrigerators and microwaves. We love having you here at the Hampton Inn - Suites Stillwater hotel in Oklahoma. - Stillwater Reg Med Ctr. An expression of appreciation from the birthplace of DT's creator, cartoonist Chester Gould. A monument to a unique bond of friendship between Ellsworth Walters and Osage Indian Chief Baconrind. 66 feet tall, a vintage 1920s-style pump topped with a 14-foot-tall globe that's lit at night. The pump was built to include a staircase and observation deck, but they were scrapped as too complicated. Completed in Oct. 2017. Adjacent museum in an old armory (opened Aug. 2016) has exhibits on Route 66, armory history, and cars.